LITTLE PINK HOUSE is based on a powerful true story of a corrupt government seizing lower middle-income homes in a small town in Connecticut for the benefit of their tax rolls. However, the movie is marred by too many profanities and obscenities, which limit its audience. Without the foul language, this could be seen by everyone, and everyone should see it. 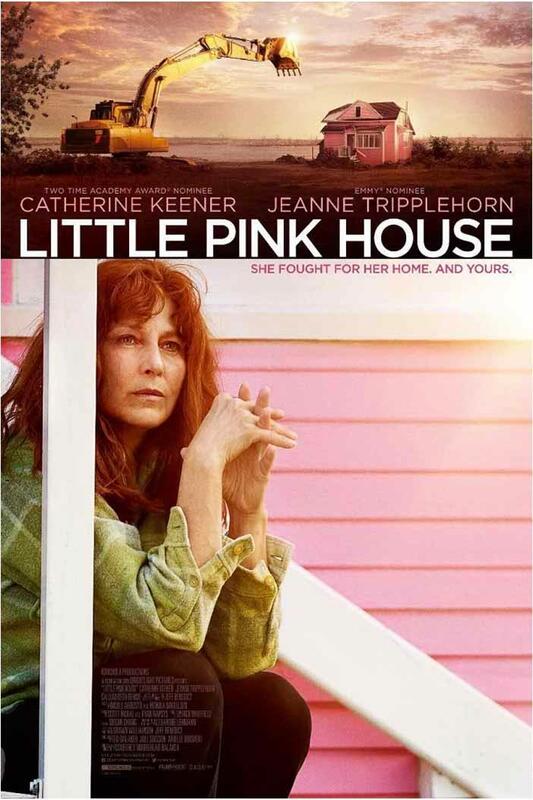 LITTLE PINK HOUSE is based on a powerful true story of a corrupt government seizing lower middle-income homes in a small town in Connecticut for the benefit of their tax rolls. The movie is extremely well-constructed and very entertaining, especially considering it’s dealing with a long historical timeframe about a very serious legal point. In understanding the legal point, it’s important to remember that English history and the U.S. Constitution were set up to protect the individual’s right to ownership of his own property. The English protection of fee simple ownership was one of the salient and important reasons England flourished while France and other European countries did not. Owning property gives people the desire to succeed and fight for their country because they’re fighting for their own property. The movie itself opens in 1997 in New London, Conn. Recently divorced, Susette Kelo, a paramedic, buys a house with a beautiful view of the harbor in a slightly rundown, lower middle-class community. She fixes it up and, in the process, falls in love with an antique dealer named Tim. New London, however, is economically depressed, and the state’s governor gets the brilliant idea to enlist an ambitious female college president named Charlotte to run the New London Development Organization and drive out all the owners, so they can develop the harbor area with a massive corporation. Charlotte talks her friend, Howard, who runs the Pfizer drug company, to build a plant in new London to manufacture their latest high-profit product, Viagra. Charlotte sends out agents to buy the properties at slightly above cost, but Susette refuses to sell. The next step is for the government to seize her land by eminent domain. However, eminent domain is only supposed to be used for public works, not to benefit a private corporation. Susette starts working with a nonprofit law firm and gets her neighbors to stand up against Charlotte. Charlotte holds a meeting in a church and presents a lot of social justice mumbo jumbo, which is really funny. So, Susette points out that, if they take her property, she’ll be homeless. She also notes that, if they take everyone’s property and turn it into high-cost housing, nobody will be able to afford to live there. If you don’t recall the news reports about the Supreme Court case featured in LITTLE PINK HOUSE, we won’t spoil the movie for you. The heart of the matter is that this is a very free market, conservative issue. A person standing against socialist mercantilism for the ownership of their own piece of property in spite of its historical, philosophical and political roots, in classic capitalist liberal economics, the case and the movie involves the normally left-wing press and a lot of firebrands and agitators who make very strange bedfellows indeed. The acting in this movie is very good. So is the direction and the writing. However, the movie is marred by too many profanities and obscenities, which limit its audience. Without the foul language, this could be seen by everyone, and everyone should see it. Government corruption, government steals property, Big Business takes government bribe, government officials and semi-private company officials lie, and Supreme Court makes a bad decision. LITTLE PINK HOUSE is based on a powerful true story. Susette Kelo, a paramedic in New London, Connecticut, buys a house overlooking the harbor. However, New London is an economically depressed area. So, the state’s governor gets the brilliant idea to enlist an ambitious career woman to drive out Susette and all the homeowners for the benefit of Big Business and the tax rolls. Susette starts working with a nonprofit law firm, and the case goes all the way to the Supreme Court. The acting in LITTLE PINK HOUSE is very good. So is the movie’s direction and the writing. Catherine Keener and Jeanne Tripplehorn do a great job as the protagonist and antagonist. LITTLE PINK HOUSE has a strong moral worldview extolling economic liberty, private property, and the free market, with some minor Christian content. It exposes the evils of socialist, fascist government in cahoots with Big Business. However, the movie is marred by too many profanities and obscenities, which limit its audience. Without the foul language, LITTLE PINK HOUSE could be seen by everyone, and everyone should see it.